The Olympus PEN E-PL5 shares the same 16-megapixel sensor and processing engine as its big brother, the OM-D E-M5. But it houses those electronics in a smaller, lighter, and less expensive package. And that alone should earn consideration for this handsome micro four-thirds camera. The $699 list price for the kit—which includes a 14-42mm f/3.5 II R zoom lens and flash—is about $500 less than the equivalent OM-D kit. The E-PL5 features a hinged 3-inch LCD that moves up and down allowing for easy composition when holding the camera at a low angle or above your head. It even swings all the way up, allowing for self-portrait compositions. The screen itself has decent resolution at 460,000 pixels, and it includes touchscreen capability. Unfortunately, the compact body doesn't have enough room for a built-in flash. Olympus ships a separate unit in the kit that slides into the accessory shoe on the top of the camera. This is a change that Olympus made in the previous model, the E-PL3, to save space. But it’s a tradeoff that I’m not crazy about. I like having a built-in flash in compact cameras. It’s one of the reasons why I’ve hung on to my older E-PL2, which has a pop-up flash. And that camera doesn’t feel that much bigger as a result. The screen has a resolution of 460,000 pixels, and it includes touchscreen capability. In fact, I think the older E-PL2 is easier to hold than this new model, at least with my large hands. Even though the E-PL5 has an interchangeable front grip (included in the kit), I still had a hard time gripping it in my right hand. Complicating the cramped ergonomics, my thumb has accidentally pressed both the movie record and the info buttons on the back of the camera while trying to achieve a firm hold for picture taking. It’s possible for a compact camera—like this one—to be too small for some people. This situation is further compounded by the protruding LCD screen. The tilting mechanism adds thickness to the display unit so it doesn’t sit evenly with the back grip. This creates a narrow area for the thumb to press against the back of the camera. So the E-PL5 isn’t as comfortable to hold as the OM-D, or even the older E-PL2. A classic mode dial sits on top of the camera with firm click stops at each of the settings. The metal shutter release button is nicely raised, making it easy to locate with your index finger, even when you're not looking at the camera. And if you set the camera to its high-speed burst rate, it fires at 8 fps. That will get the blood going. The recessed power button is easy to activate, yet is set low enough so you don’t accidentally press it while working with the camera. I had very good results editing raw files from the E-PL5 in Aperture. The rotating dial on the back can be disabled while in shooting mode via a menu setting (Custom Menu B). I recommend doing this so you don’t inadvertently change your settings while taking pictures. Playback, trash, magnification, info, and menu buttons are all clearly marked and easily accessible. The red record button allows you to initiate movie recording on the fly without having to change the mode dial to movie mode. A flip-open cover on the right side protects the HDMI and USB ports. The accessory port cover protects the hot shoe contacts and the port itself. Olympus makes a number of goodies that you can attach here, including a mic adapter (the camera body has no mic port), an electronic viewfinder, and a Bluetooth adapter, to name a few. Unfortunately, you can’t use any of these accessories if you want to take flash pictures because the separate flash unit also uses the accessory port. In focusing and image quality, the PEN E-PL5 packs a big punch for a small camera. The 16-megapixel CMOS sensor, coupled with the TruePic VI image processing engine, produces outstanding images that can compete with many APS-C DSLRs. For autofocusing, Olympus uses its FAST (Frequency Acceleration Sensor Technology) AF System that indeed lives up to its name. Even with the 14-42mm kit zoom, the E-PL5 quickly nailed the focus on every subject I tested. In dim lighting conditions, the built-in focus assist light ensured accurate results. Included in the box is a Windows and Mac version of Olympus Viewer 2 for managing and editing JPEGs and raw files. Olympus uses its proven “sensor shift” image stabilization system in the E-PL5, which gives you the freedom to use any lens you want and still have the benefits of IS. You don’t have the amazing 5-axis version that’s in the OM-D, but the stabilization is still quite good. To help keep the sensor dust free, the E-PL5 uses a supersonic wave filter that vibrates the dust away, a technology that Olympus pioneered. I’ve never had a dust problem on any of my PEN cameras. This system works well. The E-PL5 features a dozen Olympus Art Filters—Pop Art, Soft Focus, Pale and Light Color, Light Tone, Grainy Film, Pin Hole, Diorama, Gentle Sepia, Cross Process, Key Line, Dramatic Tone, and the new Watercolor filter. They can be applied when shooting by setting the mode dial to ART. Movie makers can capture up to 29 minutes of 1080 60i HD video in either .mov or .avi formats. Stereo microphones straddle the hot shoe on top of the camera, but, as previously mentioned, if you want to add an external mic, you’ll need an accessory adapter. Movie quality is good. Instead of building Wi-Fi into the camera, Olympus suggests using a Toshiba FlashAir memory card that connects with the Olympus Image Share app (for iOS and Android). The FlashAir card turns the E-PL5 into a Wi-Fi hotspot allowing it to easily connect to your iPhone or iPad to transfer pictures. Compatibility is built into the camera, with a “Connection to smartphone” option listed in the playback menu. Olympus Image Share App for iOS. It's also available for Android. The Image Share app is free, and it also includes a full complement of Olympus Art Filters that can be applied to transferred images, or to any picture on your camera roll. 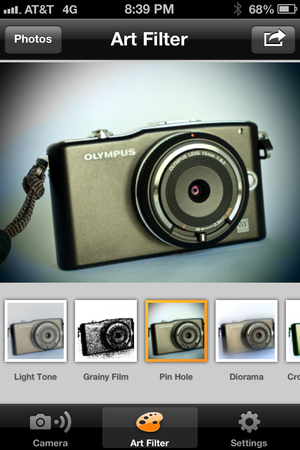 These are the same Art Filters that are built into Olympus PEN cameras and the OM-D. So if you’re curious about how they look, you can download the Image Share App and test them on your existing photos. A FlashAir card wasn’t included with the review camera that Olympus sent us, so I wasn’t able to test it. The box includes both a Windows and a Mac version of Olympus Viewer 2 for managing and editing JPEGs and raw files from the E-PL5. But you probably won’t need this tool, since Aperture, iPhoto, and Lightroom also handle the images with ease. I had very good results editing raw files from the E-PL5 in Aperture. The Olympus E-PL5 is a camera you should hold in your hands before making a buying decision. If it passes your personal ergonomics test, then the performance is sure to please. Excellent image quality combined with fast autofocusing and an impressive 8 fps burst rate make this new PEN model a top-notch performer. And features such as the flip touchscreen that rotates 170 degrees, allowing for interesting camera angles and self portraits, plus a full complement of Art Filters, add a dash of fun to its professional capabilities. Photos by Derrick Story. All rights reserved.